A square or rectangular-shaped control with a label inside that indicates action to be accomplished. The label may be either text, graphics, or both. Graphics can represent an Icon or a symbol. Purpose To start actions. To change properties. To display a pop-up menu. ==> Alles, was sofort passieren soll. Provide a rectangular shape with the label inscribed within it. Maintain consistency in style through an application. Use standard button labels when available. Use single-word labels whenever possible. Use two-three words for clarity, if necessary. Use mixed-case letters with the first letter of each label word capitalized. Display labels: In the regular system font. In the same size font. Do not number labels. Center the label within the button borders leaving at least two pixels between the text and the button border. Provide consistency in button labeling across all screens. Maintain consistency in button location between windows. Never simply “fit-in” buttons in available space. If buttons are for exiting the dialog: Position centered and aligned horizontally at the bottom. If buttons are for invoking a dialog feature or expanding the dialog: Position centered and aligned vertically on the right side. 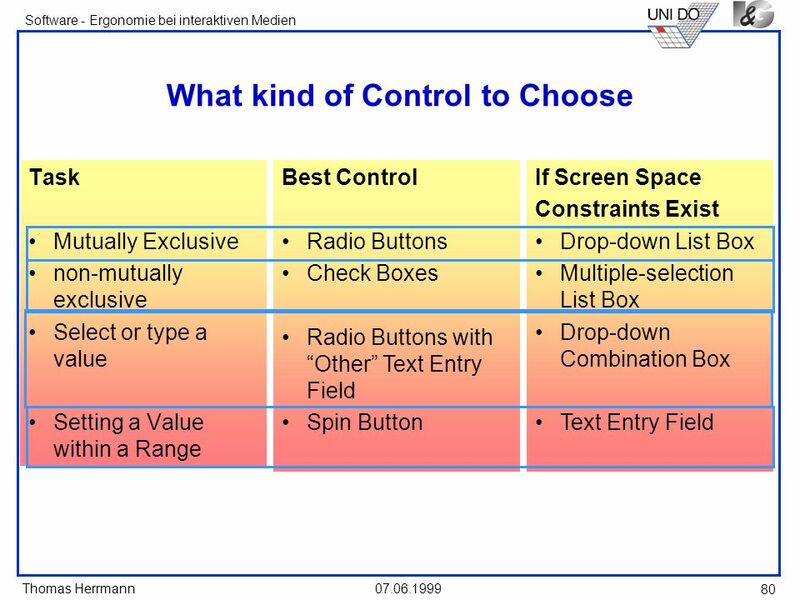 If a button has a contingent relationship to another control: Position adjacent to the related control. 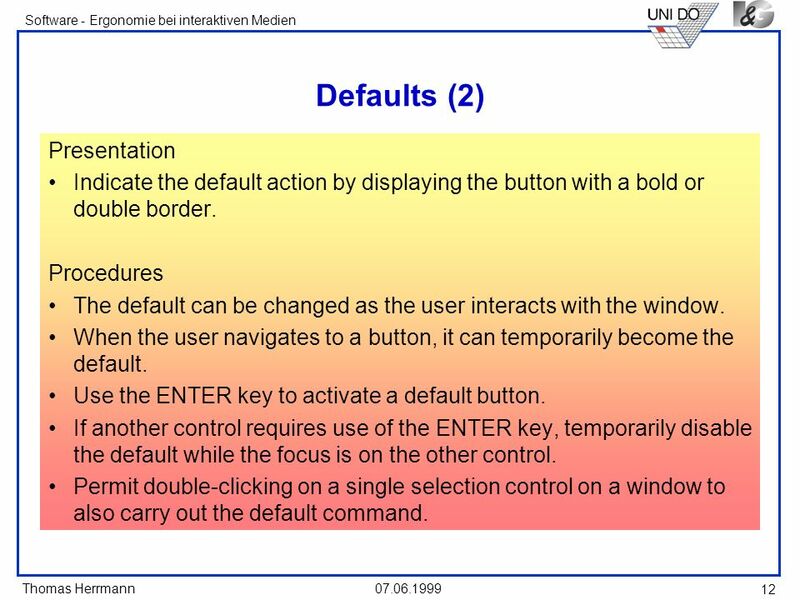 If a button has a contingent relationship to a group of controls: Position at the bottom or to right of related controls to support a logical flow For exiting and expanding/ invoking feature buttons, do not: Align with the other screen controls. Present displayed within a line border. Provide equal and adequate spacing between adjacent buttons. 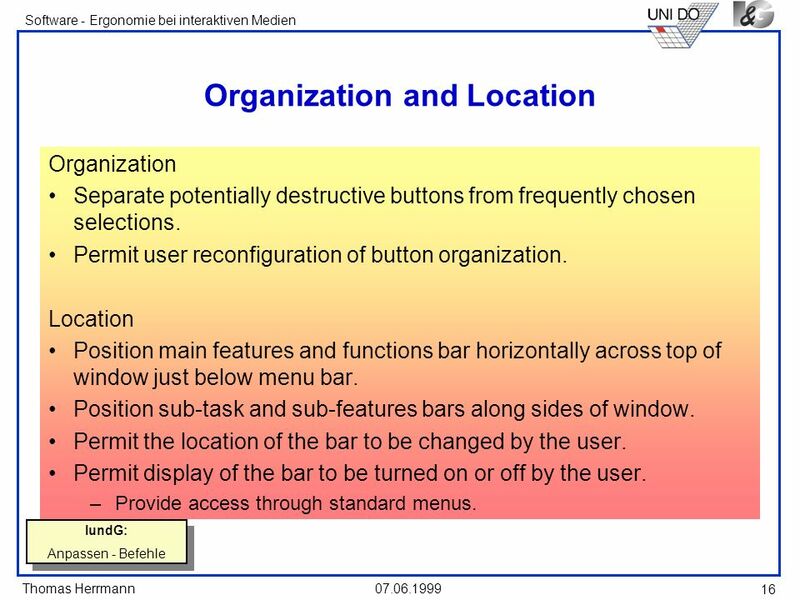 Organize standard buttons in the manner recommended by the platform being used. 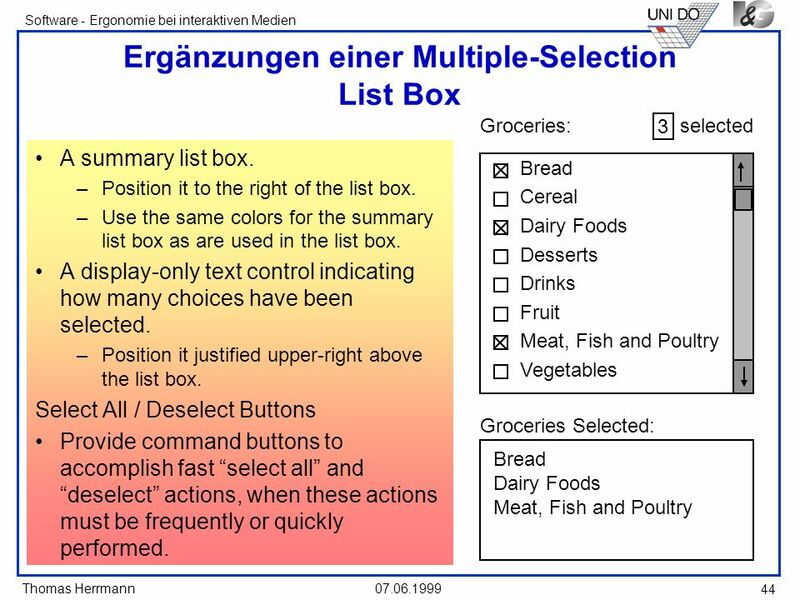 For other buttons, organize in common and customary grouping schemes. For buttons ordered left to right, place most frequent actions to the left. For buttons ordered top to bottom, place most frequent actions at the top. Keep related buttons grouped together. Separate potentially destructive buttons from frequently chosen selections. Buttons found on more than one window should be consistently positioned. The orders should never change. For mutually exclusive actions, use two buttons, do not dynamically change the text. 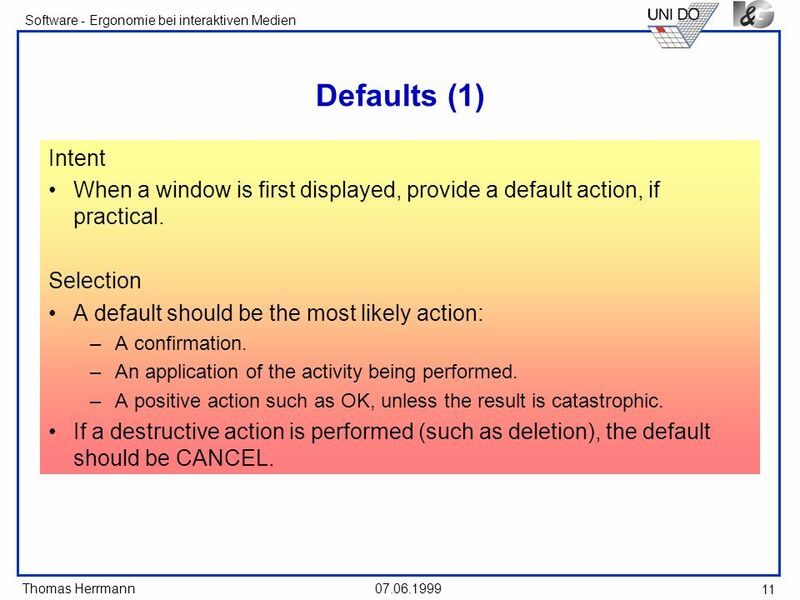 11 Defaults (1) Intent When a window is first displayed, provide a default action, if practical. Selection A default should be the most likely action: A confirmation. An application of the activity being performed. A positive action such as OK, unless the result is catastrophic. If a destructive action is performed (such as deletion), the default should be CANCEL. Indicate the default action by displaying the button with a bold or double border. Procedures The default can be changed as the user interacts with the window. When the user navigates to a button, it can temporarily become the default. Use the ENTER key to activate a default button. If another control requires use of the ENTER key, temporarily disable the default while the focus is on the other control. Permit double-clicking on a single selection control on a window to also carry out the default command. Usage To provide easy access to most frequently used commands or options. To invoke a sub-application within an application. Size Button. 24 (w) by 22 (h) pixels including border. 32 (w) by 30 (h) pixels inculding border. Larger buttons can be used on high resolution displays. Label. 16 (w) by 16 (h) pixels. 14 (w) by 24 (h) pixels. Default. Provide the smaller size as the default with a user option to change. Image Center image in button. + Easy to access choices. + Easy to compare choices. + Preferred by users. - Consume screen space. - Limited number of choices. A two-part control consisting of: A square box. Choice text. Each option acts as a switch and can be either “on” or “off”. 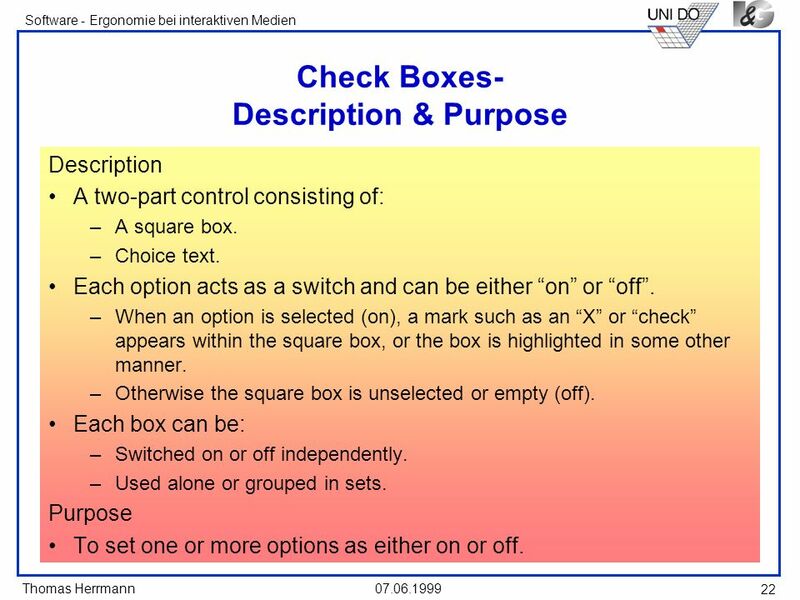 When an option is selected (on), a mark such as an “X” or “check” appears within the square box, or the box is highlighted in some other manner. 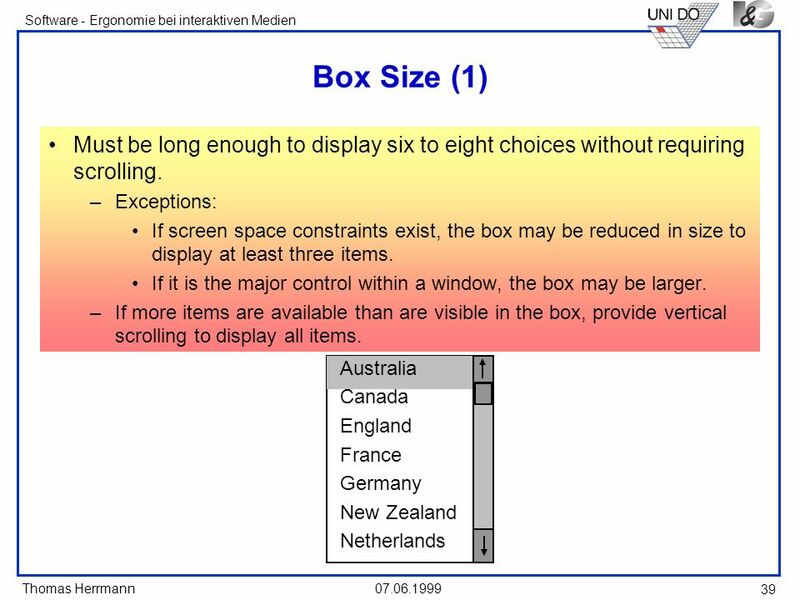 Otherwise the square box is unselected or empty (off). Each box can be: Switched on or off independently. Used alone or grouped in sets. Purpose To set one or more options as either on or off. Provide meaningful, fully spelled-out choice descriptions clearly describing the values or effects set by the radio buttons. Display in a single line of text. Display using mixed-case letters with each significant word capitalized. 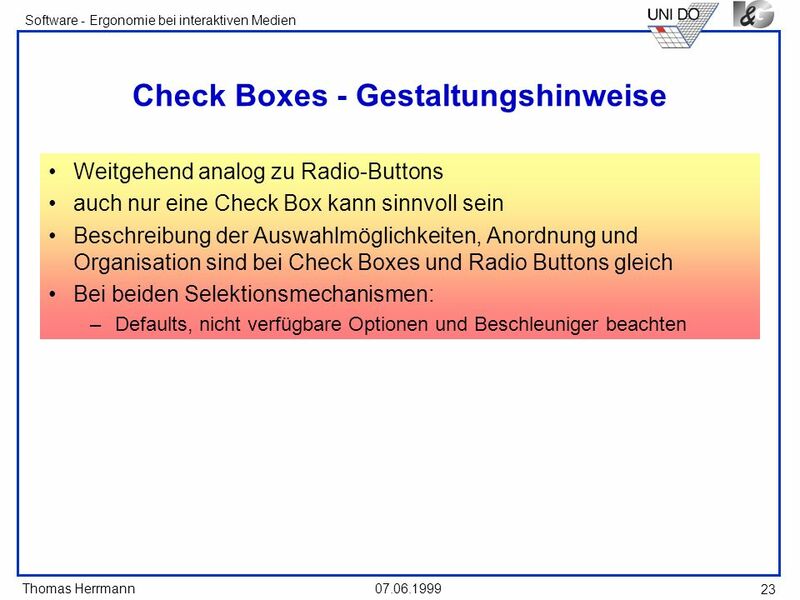 Position descriptions to the right of the button / box. Separate by at least one space from the button. 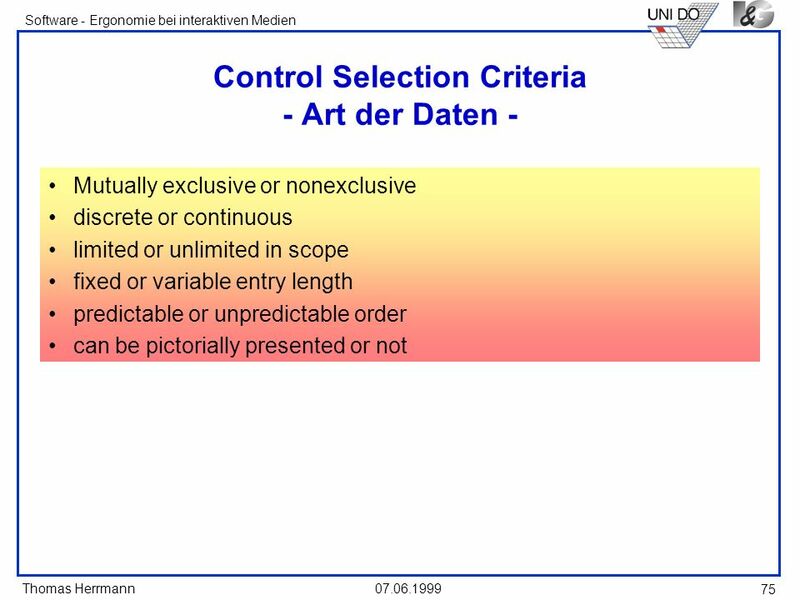 When a choice is conditionally unavailable for selection, display choice description grayed or dimmed. RADIO BUTTONS: Include a NONE choice if it adds clarity. 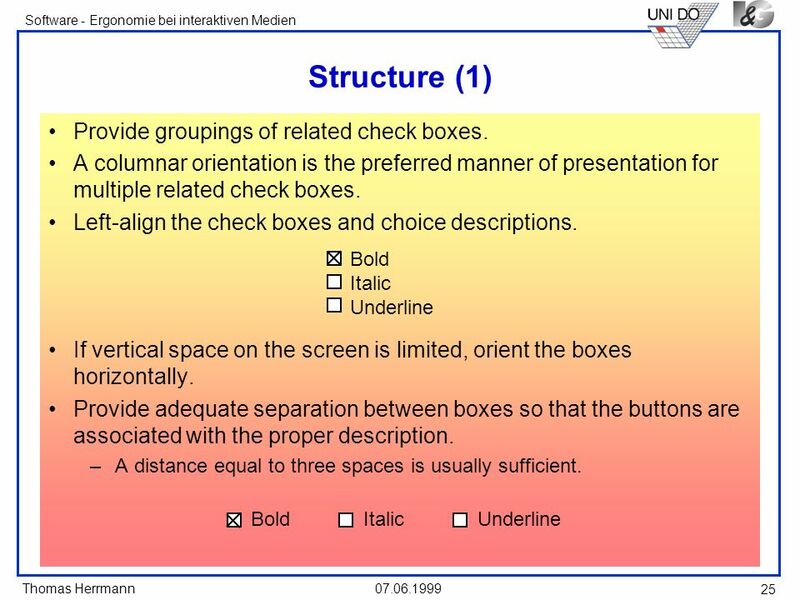 25 Structure (1) Provide groupings of related check boxes. Activation When a choice is selected, distinguish it visually from the nonselected choices. 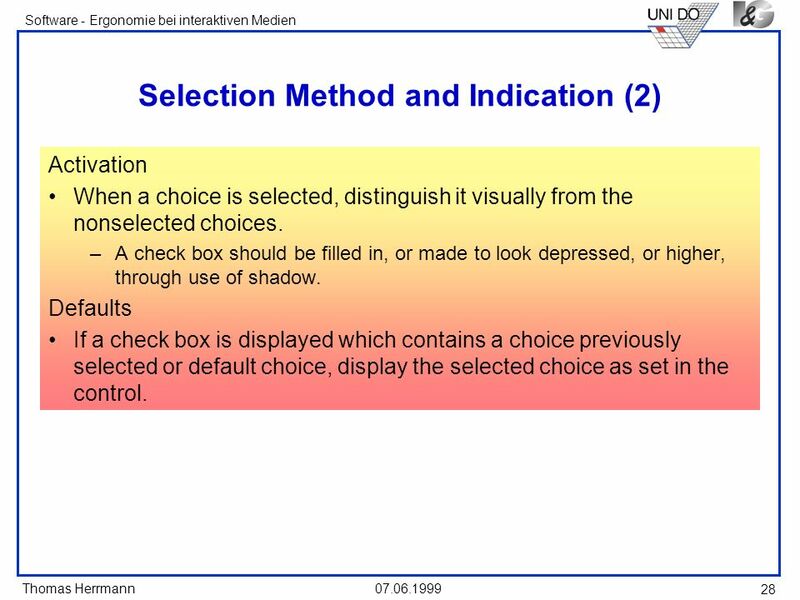 A check box should be filled in, or made to look depressed, or higher, through use of shadow. Defaults If a check box is displayed which contains a choice previously selected or default choice, display the selected choice as set in the control. 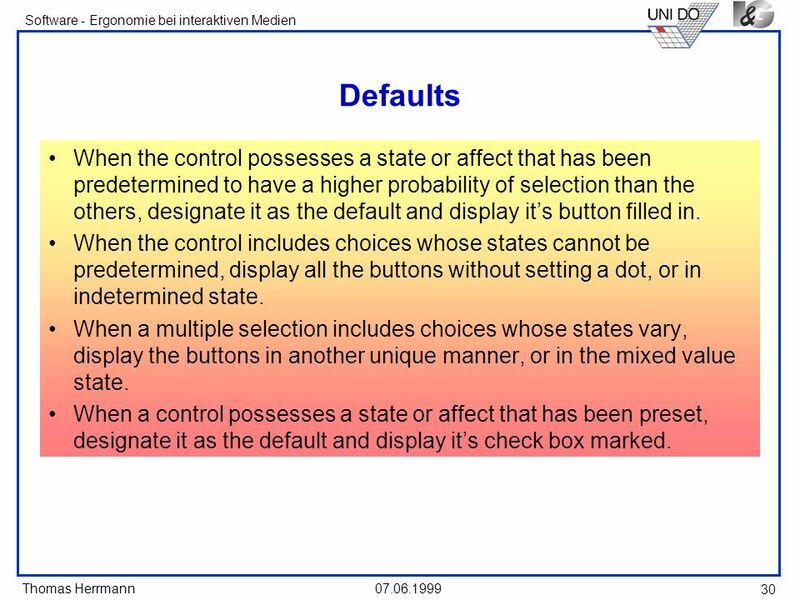 30 Defaults When the control possesses a state or affect that has been predetermined to have a higher probability of selection than the others, designate it as the default and display it’s button filled in. 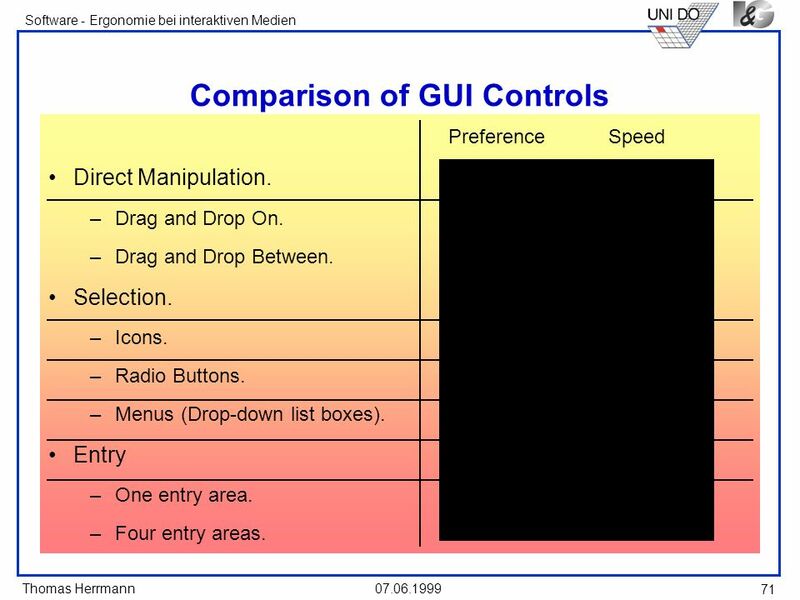 When the control includes choices whose states cannot be predetermined, display all the buttons without setting a dot, or in indetermined state. 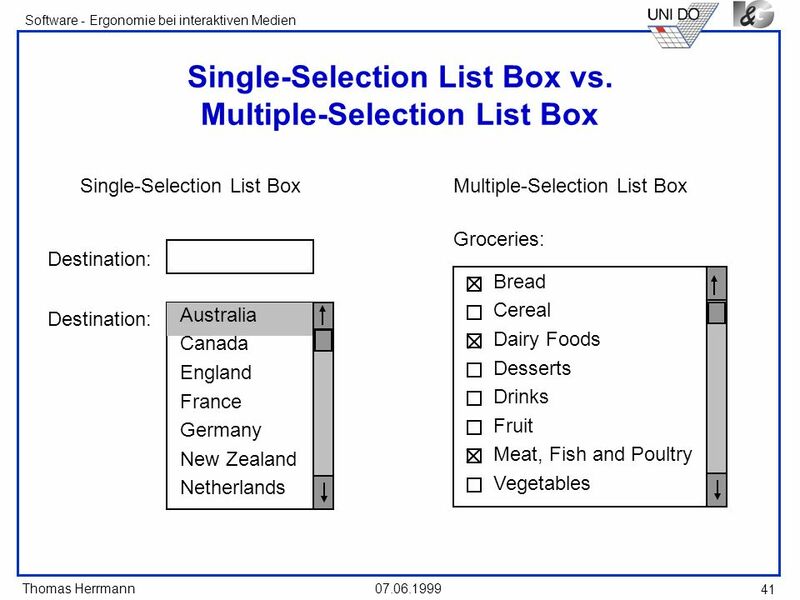 When a multiple selection includes choices whose states vary, display the buttons in another unique manner, or in the mixed value state. When a control possesses a state or affect that has been preset, designate it as the default and display it’s check box marked. 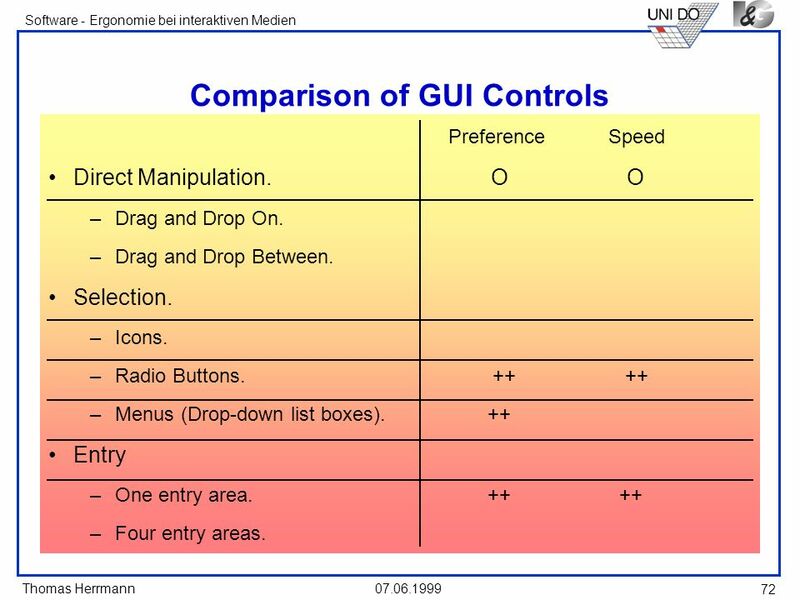 A control consisting of a series of graphical alternatives. The choices themselves are descriptive, being comprised of colors, patterns, or impages. 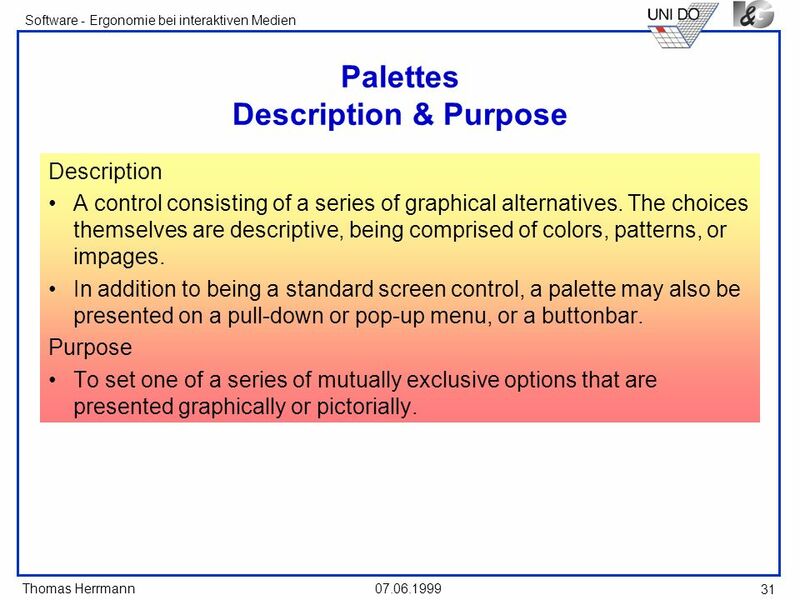 In addition to being a standard screen control, a palette may also be presented on a pull-down or pop-up menu, or a buttonbar. Purpose To set one of a series of mutually exclusive options that are presented graphically or pictorially. + Pictures aid comprehension. + Easy to compare choices. 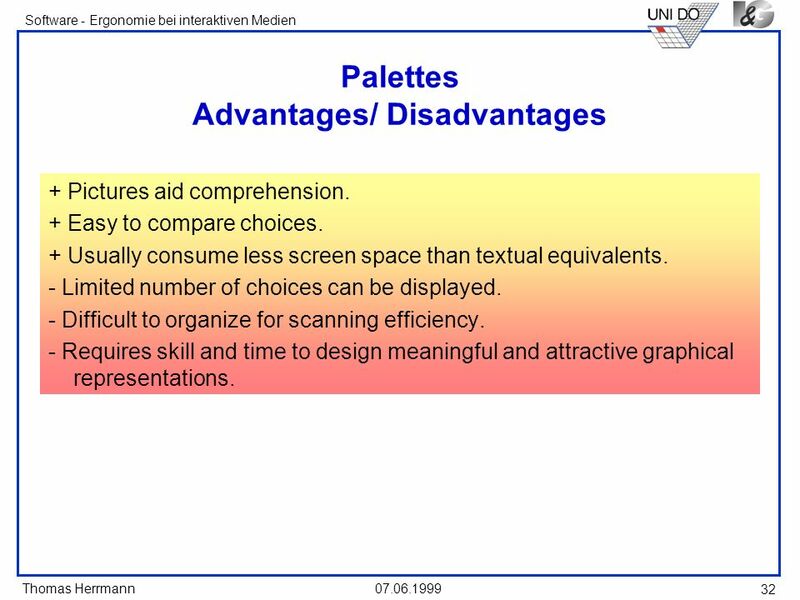 + Usually consume less screen space than textual equivalents. - Limited number of choices can be displayed. - Difficult to organize for scanning efficiency. 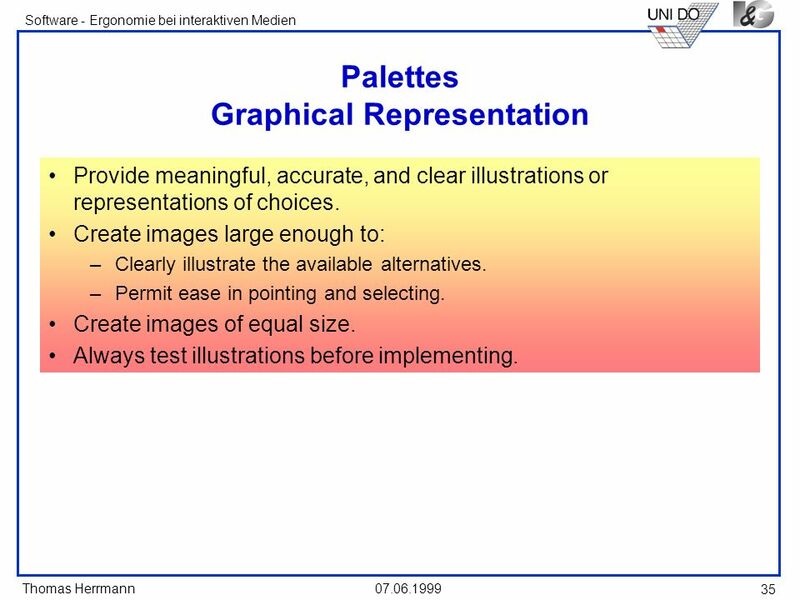 - Requires skill and time to design meaningful and attractive graphical representations. For setting attributes, properties, or values. For mutually exclusive choices (i.e., only one can be selected). Where adequate screen space is available. 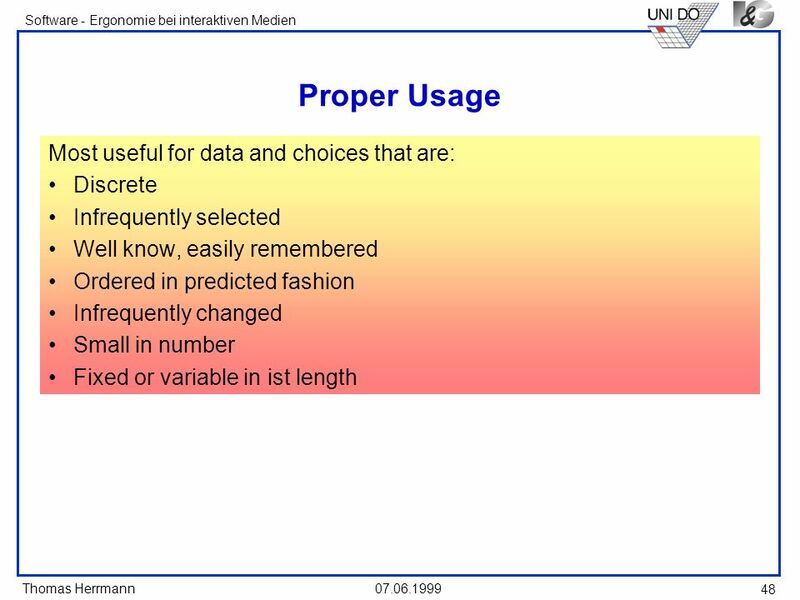 Most useful for data and choices that are: Discrete. Frequently selected. Limited in number. Variable in number. Most easily understood when the alternatives may be seen together and compared to one another. Most meaningfully represented pictorially or by example. Can be clearly represented pictorially. Rarely changed in content. 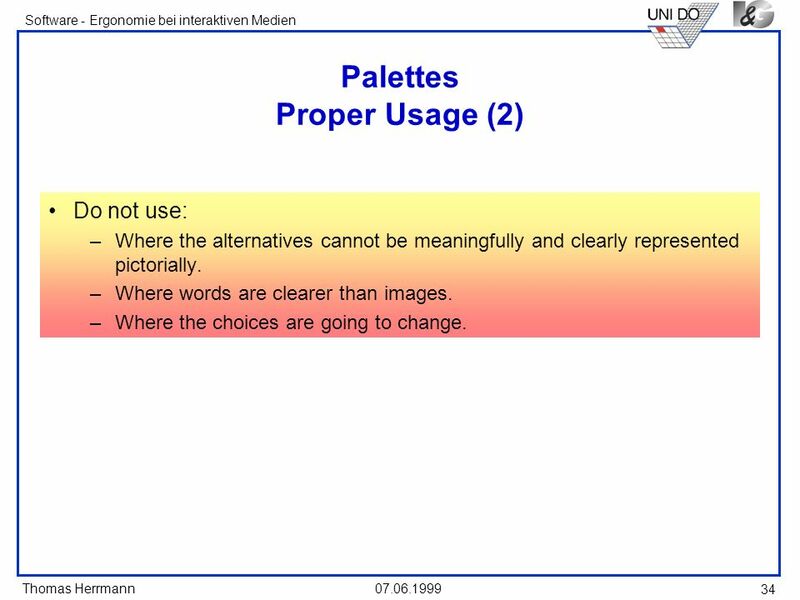 Do not use: Where the alternatives cannot be meaningfully and clearly represented pictorially. Where words are clearer than images. Where the choices are going to change. Provide meaningful, accurate, and clear illustrations or representations of choices. Create images large enough to: Clearly illustrate the available alternatives. Permit ease in pointing and selecting. Create images of equal size. Always test illustrations before implementing. 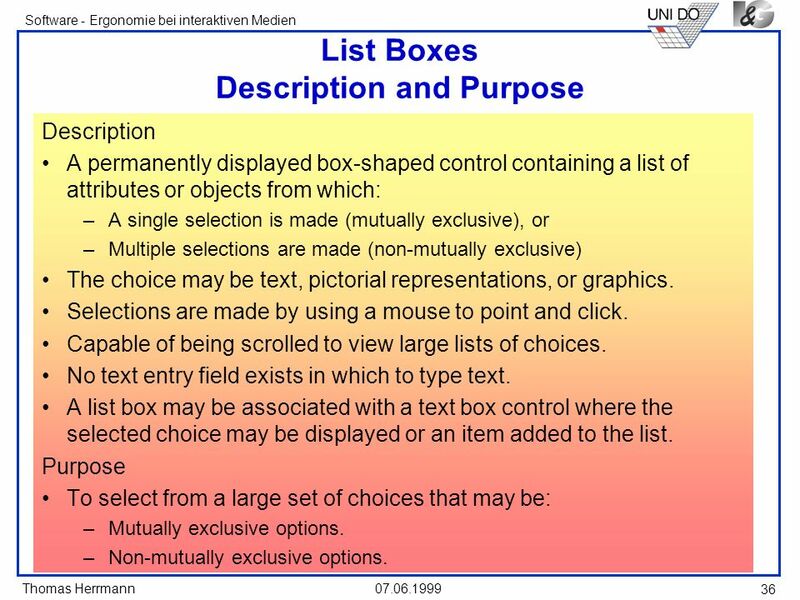 A permanently displayed box-shaped control containing a list of attributes or objects from which: A single selection is made (mutually exclusive), or Multiple selections are made (non-mutually exclusive) The choice may be text, pictorial representations, or graphics. 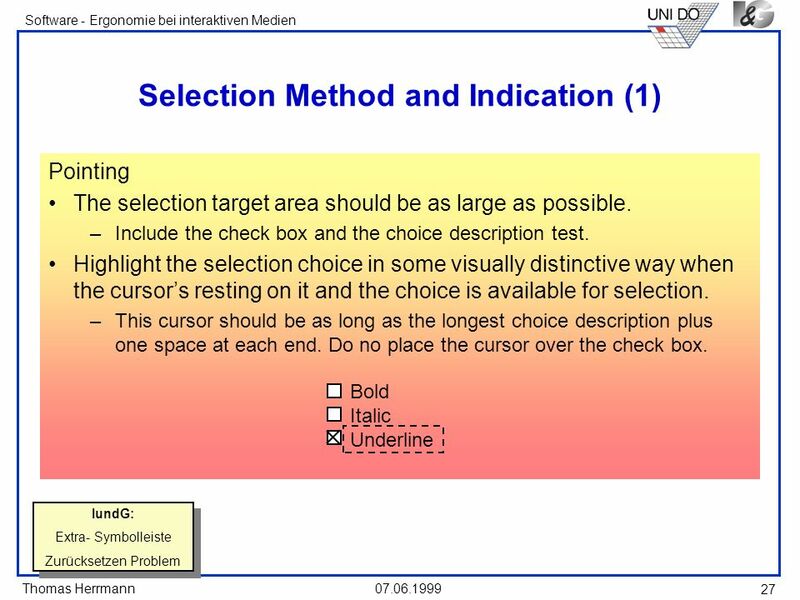 Selections are made by using a mouse to point and click. Capable of being scrolled to view large lists of choices. No text entry field exists in which to type text. 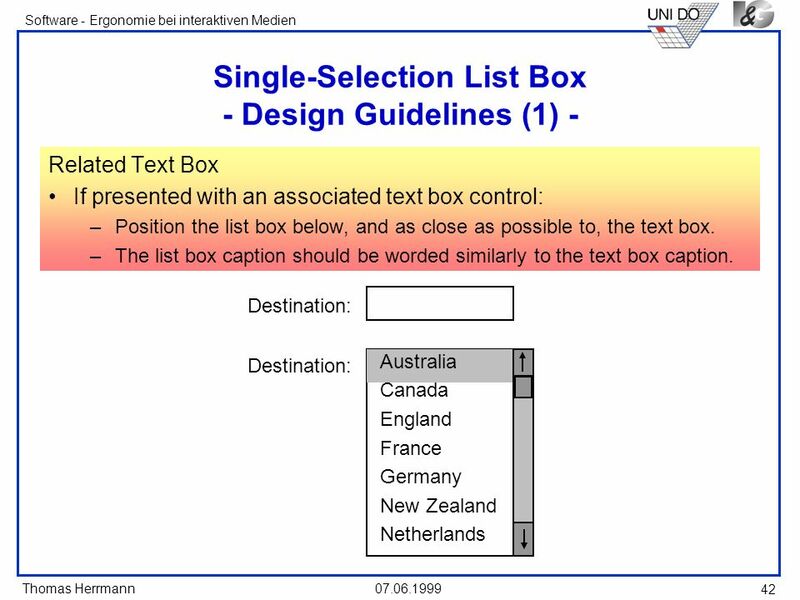 A list box may be associated with a text box control where the selected choice may be displayed or an item added to the list. Purpose To select from a large set of choices that may be: Mutually exclusive options. Non-mutually exclusive options. 38 List Size Not limited in size. Present all available alternatives. 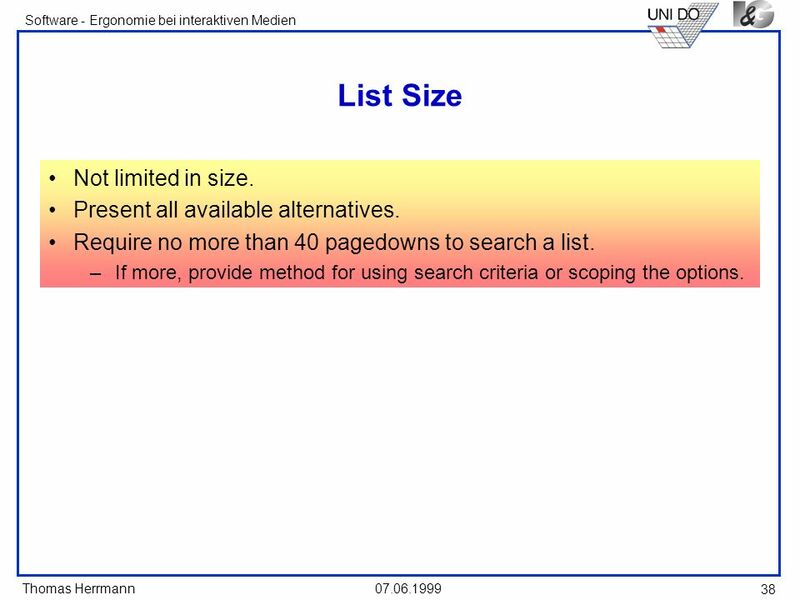 Require no more than 40 pagedowns to search a list. If more, provide method for using search criteria or scoping the options. 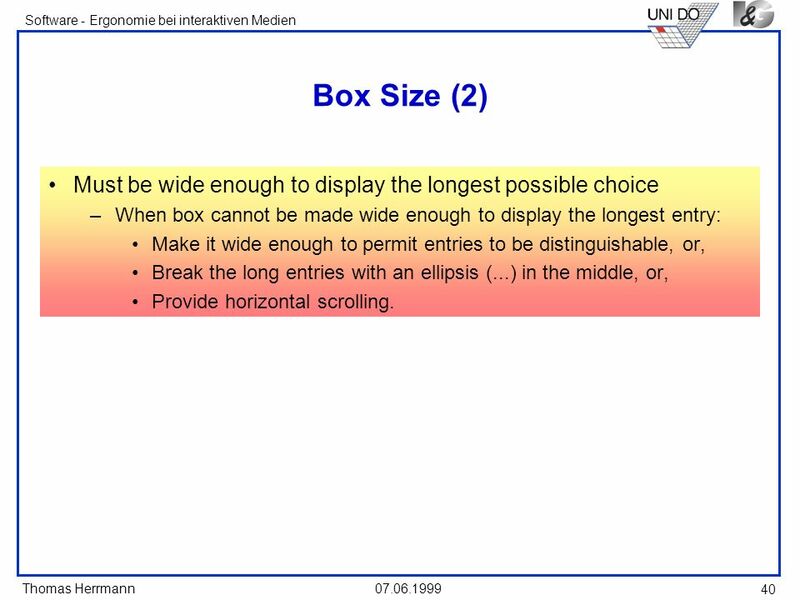 40 Box Size (2) Must be wide enough to display the longest possible choice When box cannot be made wide enough to display the longest entry: Make it wide enough to permit entries to be distinguishable, or, Break the long entries with an ellipsis (...) in the middle, or, Provide horizontal scrolling. 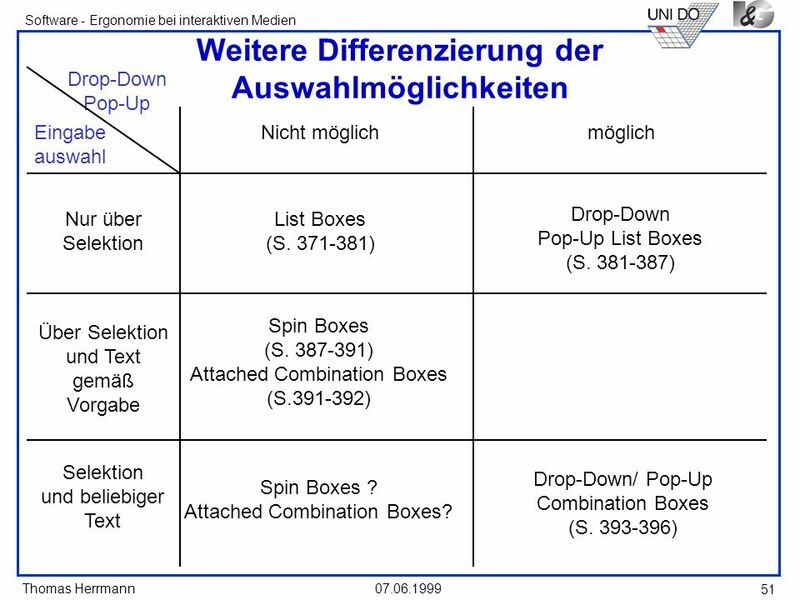 Drop-Down Pop-Up Eingabe auswahl Nicht möglich möglich Nur über Selektion Über Selektion und Text gemäß Vorgabe Selektion und beliebiger Text Drop-Down Pop-Up List Boxes (S ) List Boxes (S ) IundG: Schrift - Selektion und beliebiger Text bei Schriftgröße und bei Schriftart Spin Boxes (S ) Attached Combination Boxes (S ) IundG: Zoom-Einstellung - Entertaste beachten Drop-Down/ Pop-Up Combination Boxes (S ) Spin Boxes ? 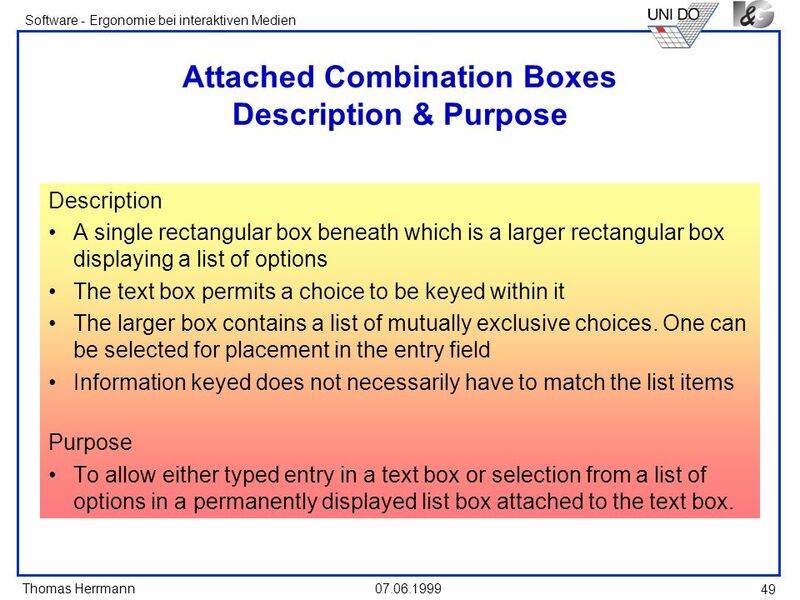 Attached Combination Boxes? 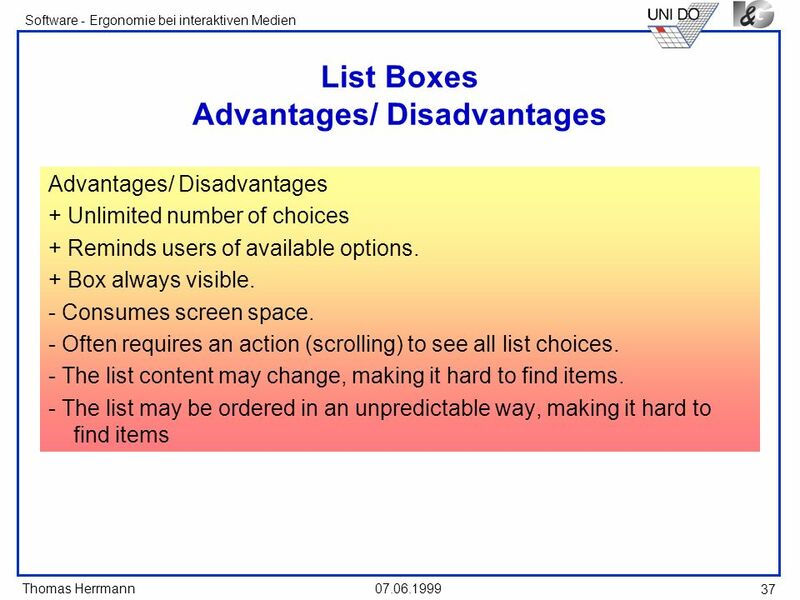 A single rectangular box beneath which is a larger rectangular box displaying a list of options The text box permits a choice to be keyed within it The larger box contains a list of mutually exclusive choices. 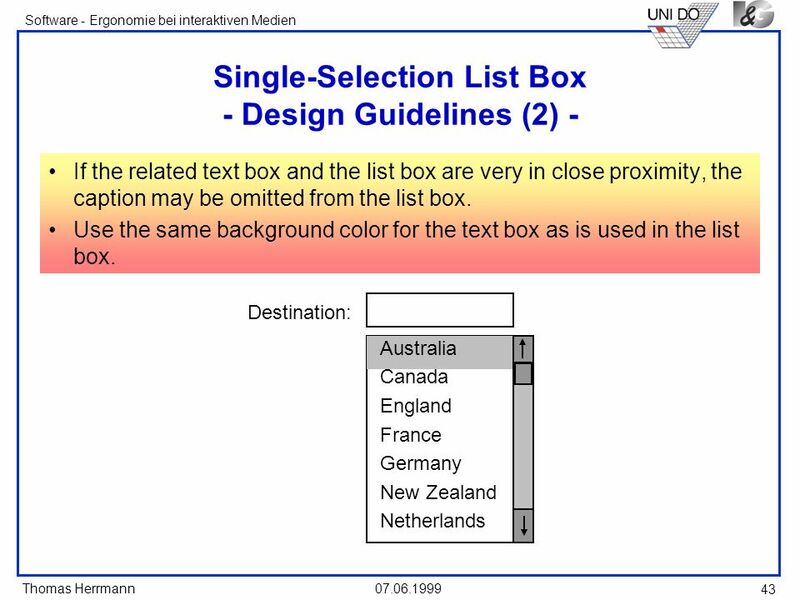 One can be selected for placement in the entry field Information keyed does not necessarily have to match the list items Purpose To allow either typed entry in a text box or selection from a list of options in a permanently displayed list box attached to the text box. Best represented textually. Somewhat familiar or known. Ordered in a non-predictable fashion. Frequently changed. Large in number. Variable or fixed in list length. 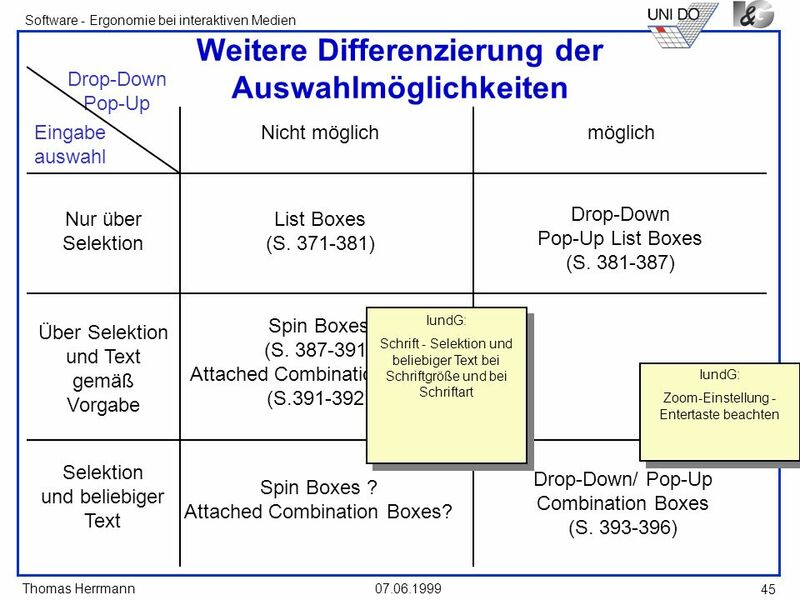 Drop-Down Pop-Up Eingabe auswahl Nicht möglich möglich Nur über Selektion Über Selektion und Text gemäß Vorgabe Selektion und beliebiger Text Drop-Down Pop-Up List Boxes (S ) List Boxes (S ) Spin Boxes (S ) Attached Combination Boxes (S ) Drop-Down/ Pop-Up Combination Boxes (S ) Spin Boxes ? Attached Combination Boxes? A scale exhibiting more or less of a quality on a continuum. Includes the following: A shaft or bar. A range of values with appropriate labels. An arm indicating relative setting through its location on the shaft. 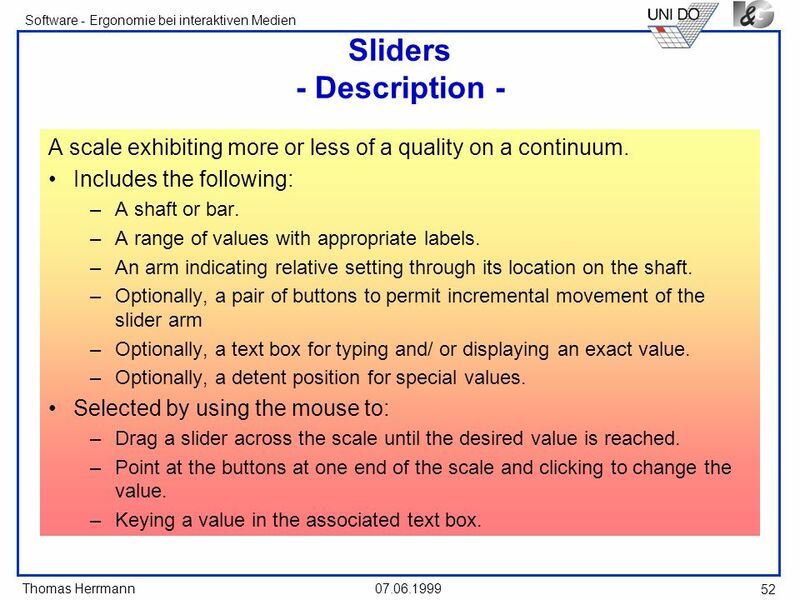 Optionally, a pair of buttons to permit incremental movement of the slider arm Optionally, a text box for typing and/ or displaying an exact value. Optionally, a detent position for special values. Selected by using the mouse to: Drag a slider across the scale until the desired value is reached. Point at the buttons at one end of the scale and clicking to change the value. 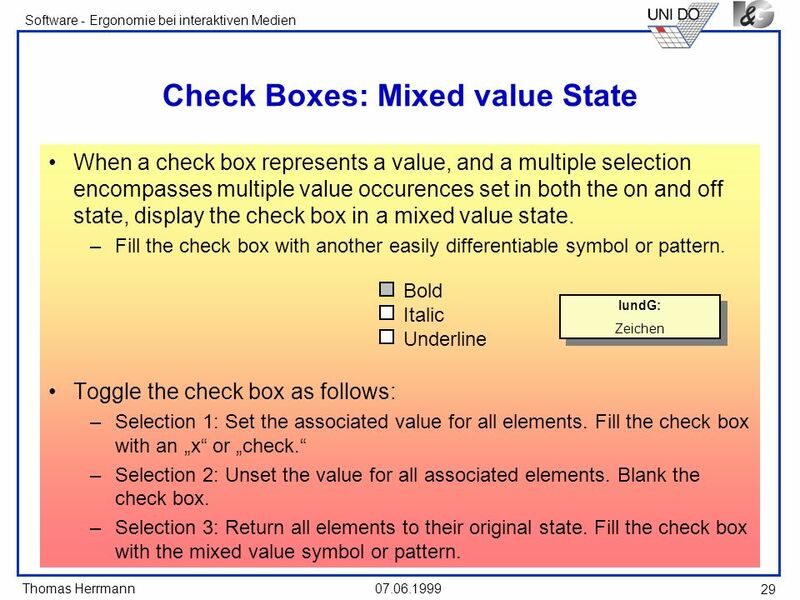 Keying a value in the associated text box. 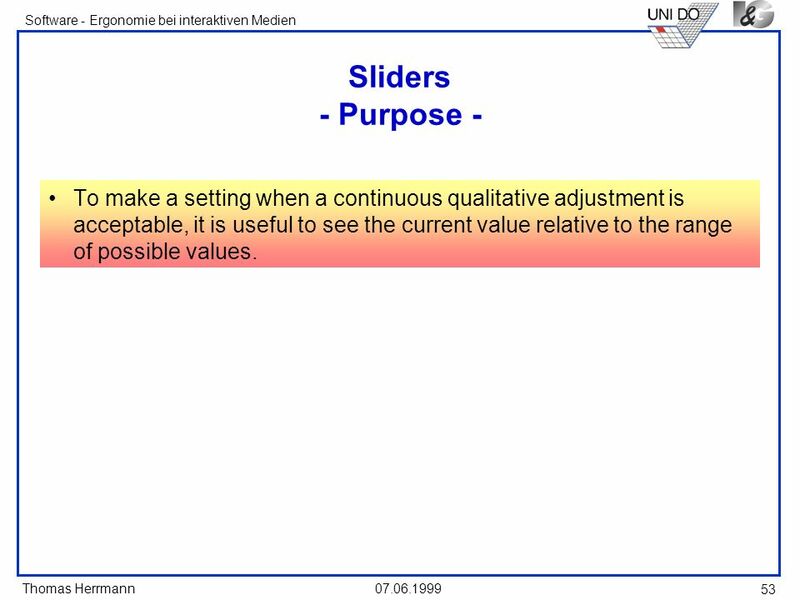 53 Sliders - Purpose - To make a setting when a continuous qualitative adjustment is acceptable, it is useful to see the current value relative to the range of possible values. 55 Slider Proper Usage To set an attribute. For mutually exclusive choices. When an object has a limited range of possible settings. When the range of values is continuous. When graduations are relatively fine. When the choices can increase or decrease in some well-known, predictable, and easily understood way. When a spatial representation enhances comprehension and interpretation. 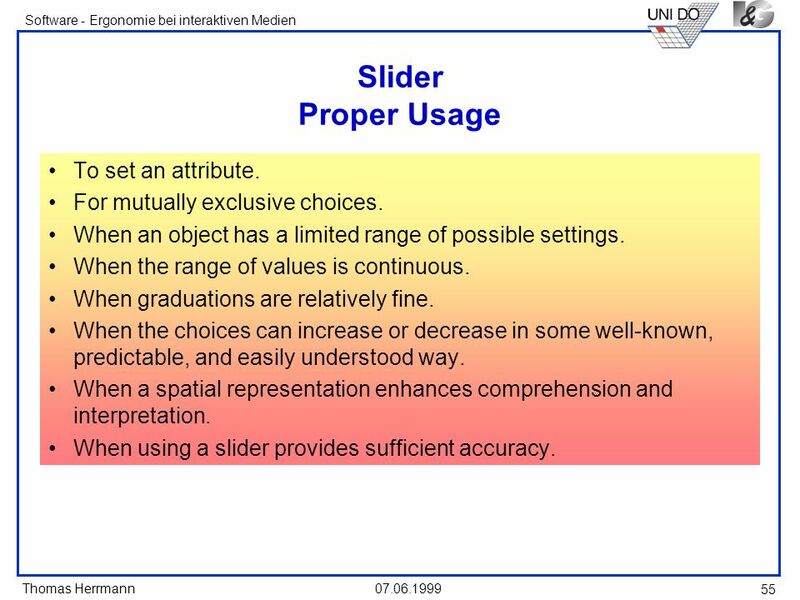 When using a slider provides sufficient accuracy. 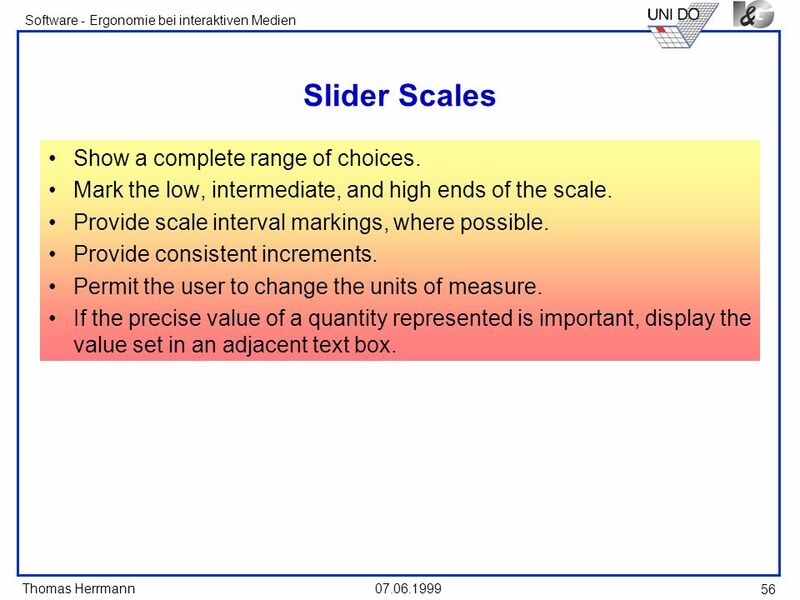 56 Slider Scales Show a complete range of choices. Mark the low, intermediate, and high ends of the scale. 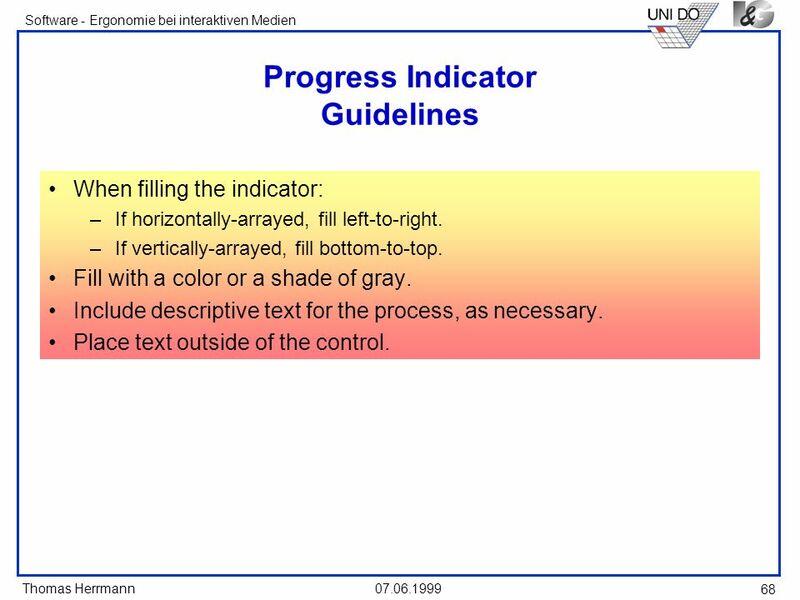 Provide scale interval markings, where possible. Provide consistent increments. Permit the user to change the units of measure. If the precise value of a quantity represented is important, display the value set in an adjacent text box. 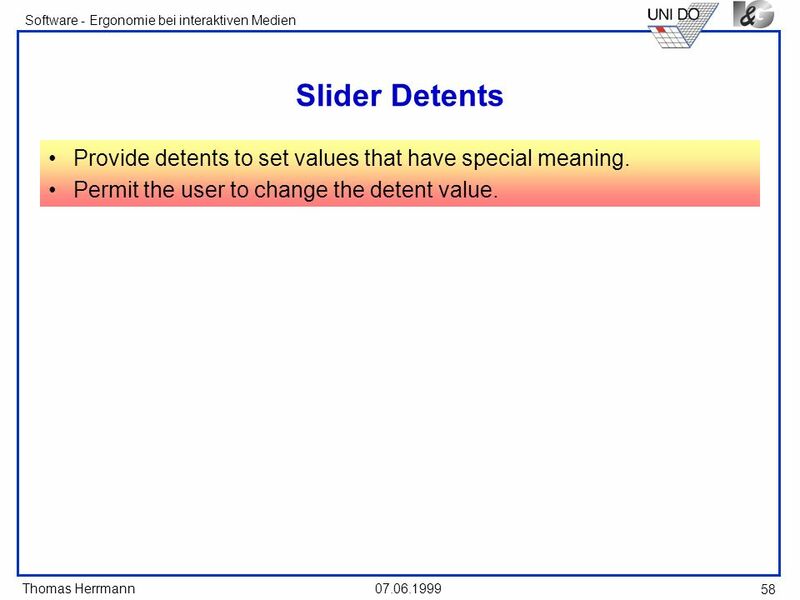 58 Slider Detents Provide detents to set values that have special meaning. Permit the user to change the detent value. Place related information within a section. Pages Order meaningfully. Arrange pages so they appear to go deeper, left-to-right and top-to-bottom. Provide pages of equal size. If there is more than one page in a section, provide page numbers in a consistent location within the page. 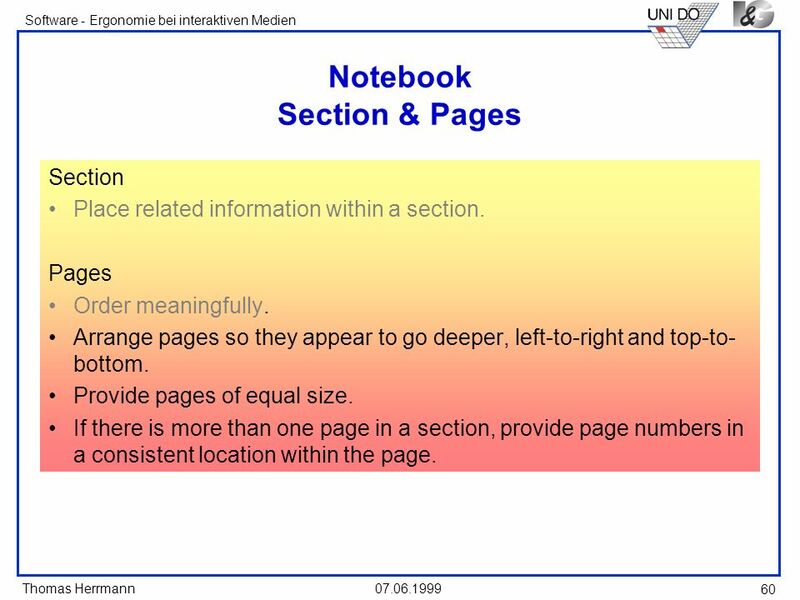 61 Notebook Tabs Provide fixed-width tabs for sections of related information. Provide either text or graphic labels. If text: Use system fonts. Use mixed-case, capitalizing each significant word. Assign a mnemonic for keyboard access. 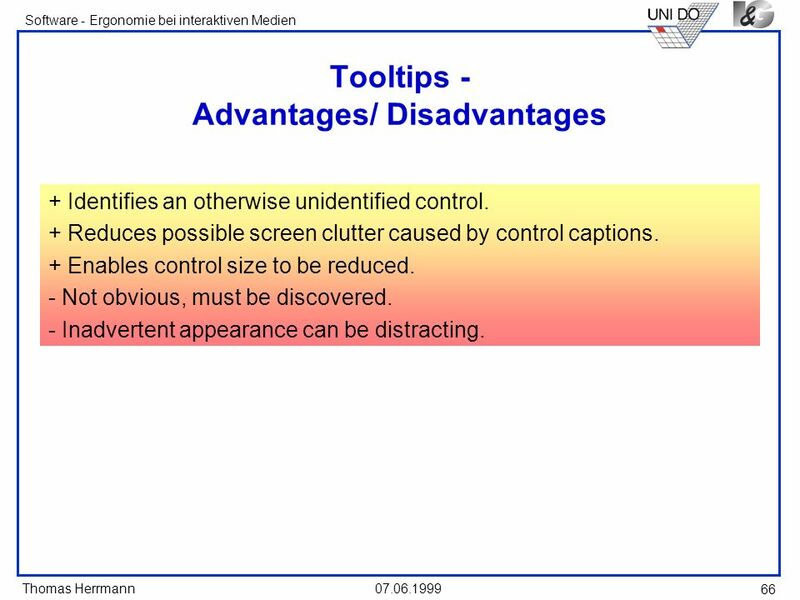 If graphics, provide tooltip controls. Center the labels within the tabs. Restrict tabs to only one row. 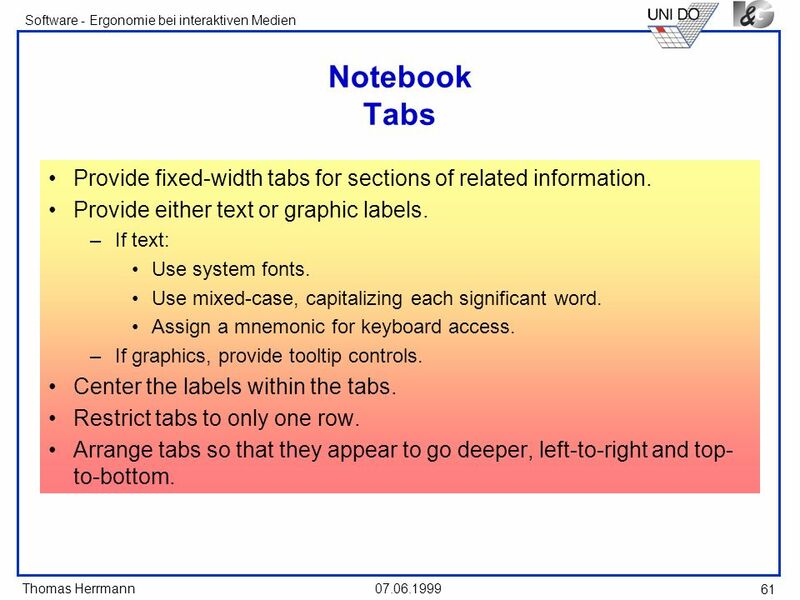 Arrange tabs so that they appear to go deeper, left-to-right and top-to-bottom. To find and view information that takes more space than the allotted display space. Advantages/ Disadvantages + Permits viewing data of unlimited size. - Consumes screen space. - Can be cumbersome to operate. Proper Use When more information is available than the window space for displaying it. Do not use to set values. Scroll Slider Box or Handle To indicate the location and amount of information being viewed, provide a slider box or handle. Constructed of a movable and sizable open area of the scroll area displayed in a technique that contrasts with the scroll area. Indicate by its position, spatially, the relative location in the file of the information being viewed. 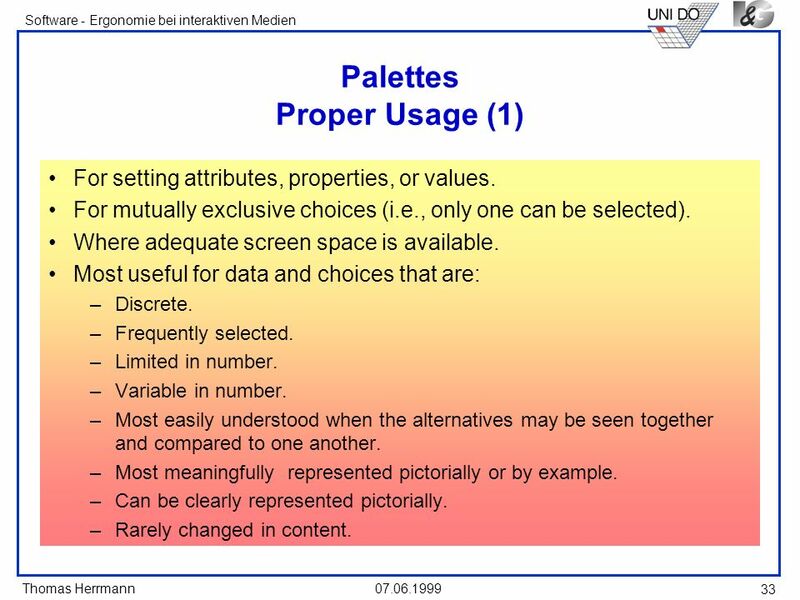 Indicate by its size, proportionately, the percentage of the available information in the file being viewed. Scroll Directional Arrows To indicate the direction that scrolling may be performed, directional arrows should be provided. 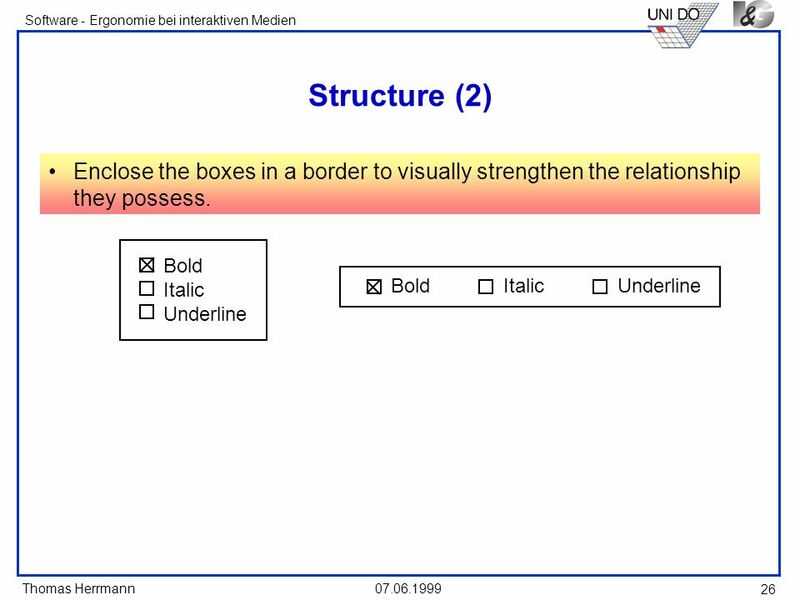 Construct of arrows in small boxes with backgrounds contrasting with the scroll area. Selection When the slider box/ handle has been selected, highlight it in some visually distinctive way. Location Position a vertically (top-to-bottom) scroll bar to the right of the window. 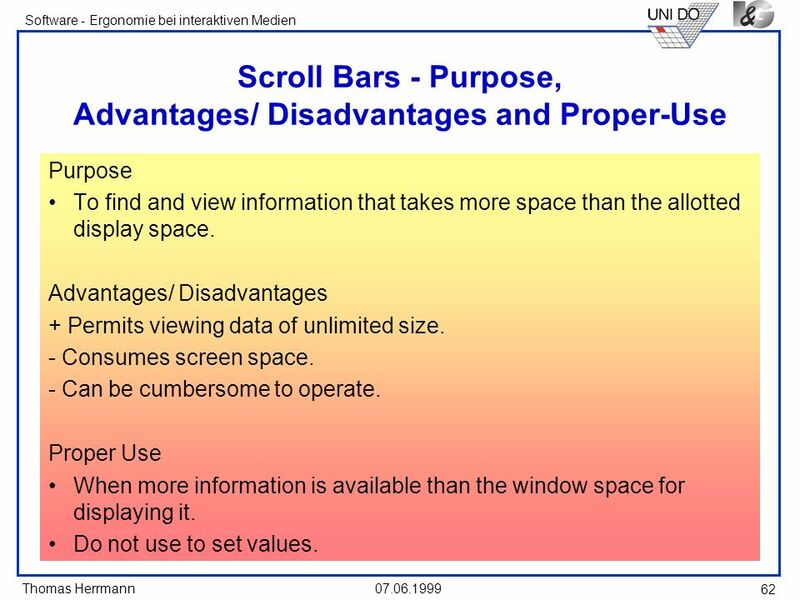 Position a horizontal (left-to-right) scroll bar at the bottom of the window. 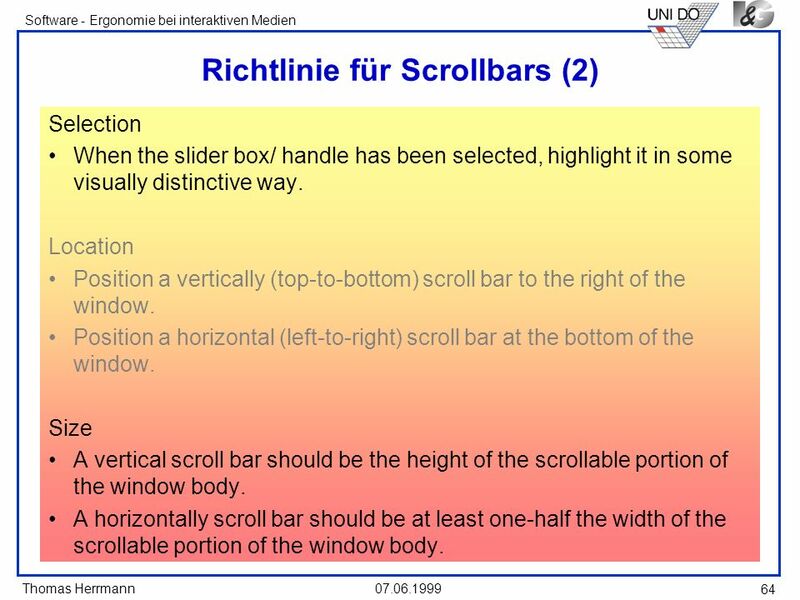 Size A vertical scroll bar should be the height of the scrollable portion of the window body. 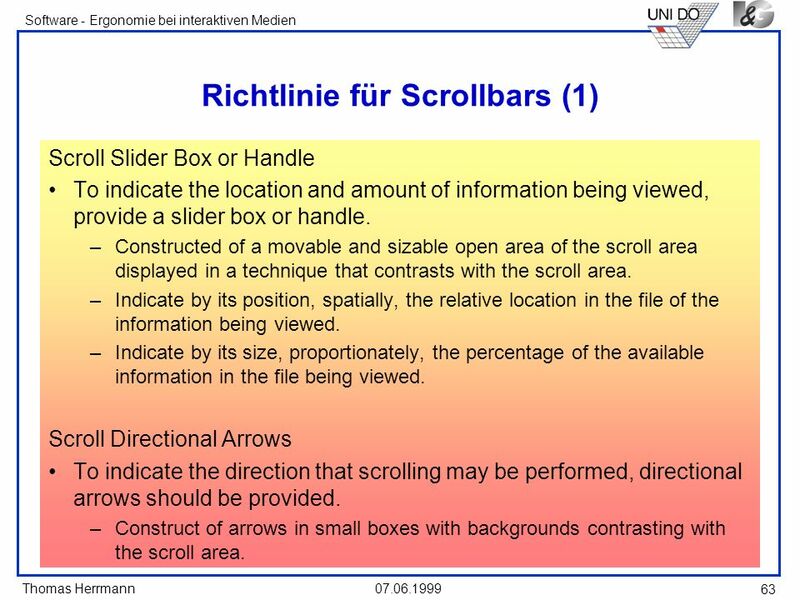 A horizontally scroll bar should be at least one-half the width of the scrollable portion of the window body. Current State Indication Whenever the window size or information position changes, the scroll bar components must also change, reflecting the current state. Include scroll bars in all sizable windows. If no information is currently available through scrolling in a particular direction, the relevant directional arrow should be subdued or grayed. 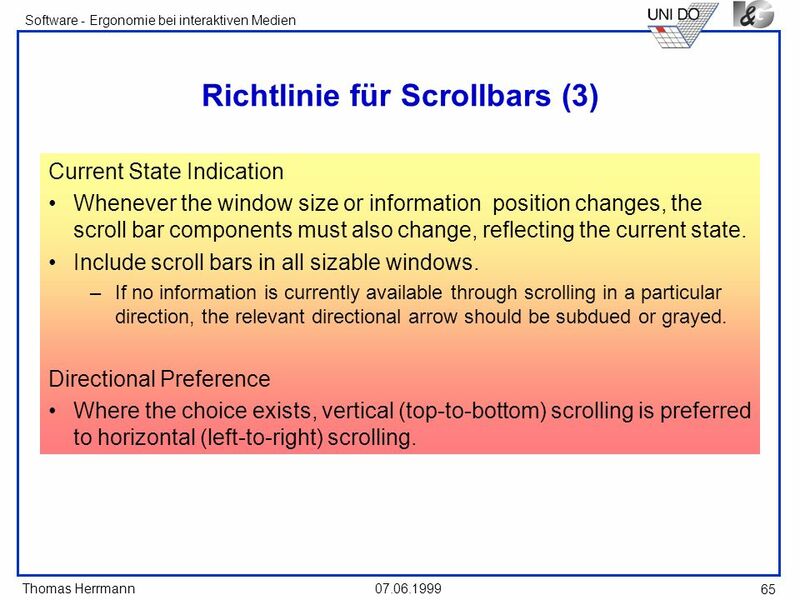 Directional Preference Where the choice exists, vertical (top-to-bottom) scrolling is preferred to horizontal (left-to-right) scrolling. + Identifies an otherwise unidentified control. + Reduces possible screen clutter caused by control captions. + Enables control size to be reduced. - Not obvious, must be discovered. - Inadvertent appearance can be distracting. 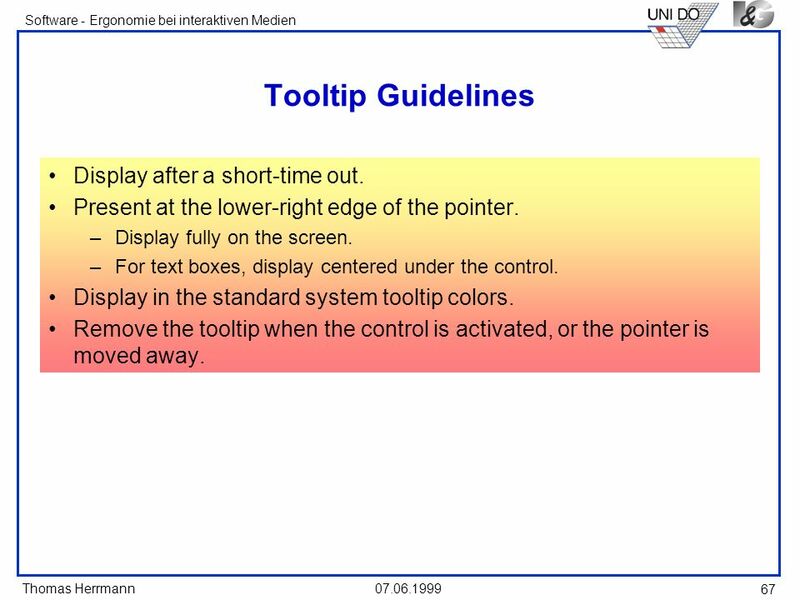 67 Tooltip Guidelines Display after a short-time out. Present at the lower-right edge of the pointer. Display fully on the screen. For text boxes, display centered under the control. Display in the standard system tooltip colors. Remove the tooltip when the control is activated, or the pointer is moved away. When filling the indicator: If horizontally-arrayed, fill left-to-right. If vertically-arrayed, fill bottom-to-top. Fill with a color or a shade of gray. Include descriptive text for the process, as necessary. Place text outside of the control. 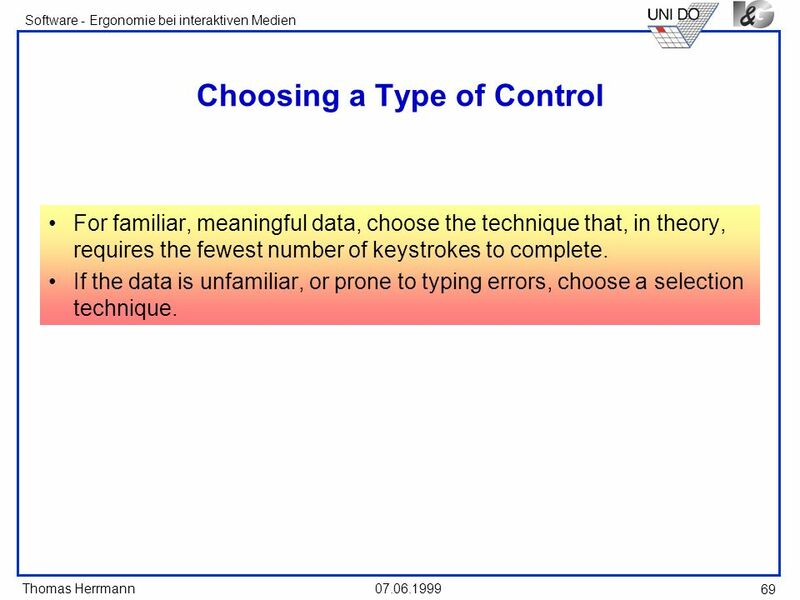 For familiar, meaningful data, choose the technique that, in theory, requires the fewest number of keystrokes to complete. 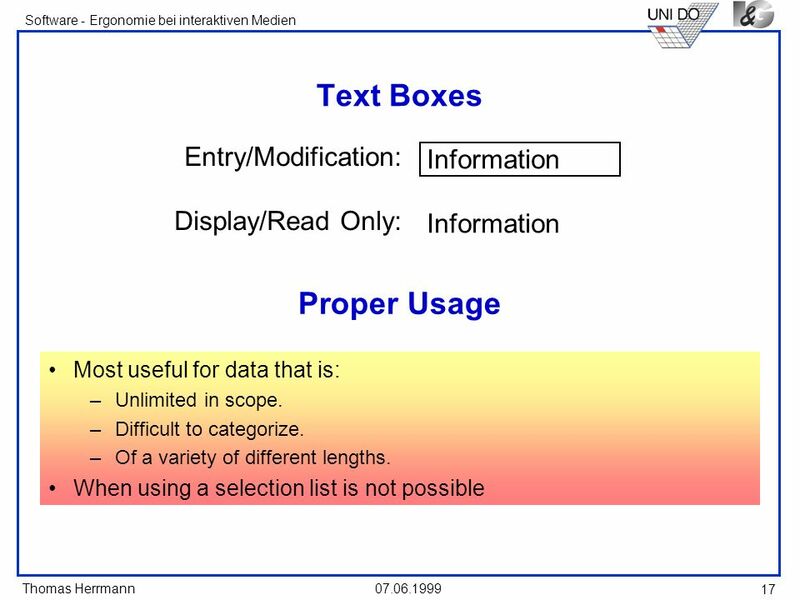 If the data is unfamiliar, or prone to typing errors, choose a selection technique. 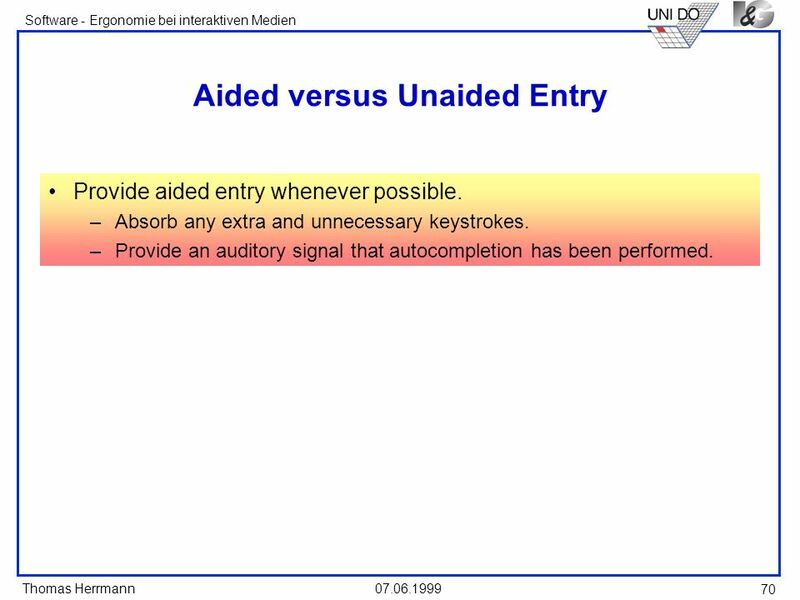 Provide aided entry whenever possible. Absorb any extra and unnecessary keystrokes. Provide an auditory signal that autocompletion has been performed. Preference	Speed Direct Manipulation O	O Drag and Drop On. Drag and Drop Between. Selection. Icons. 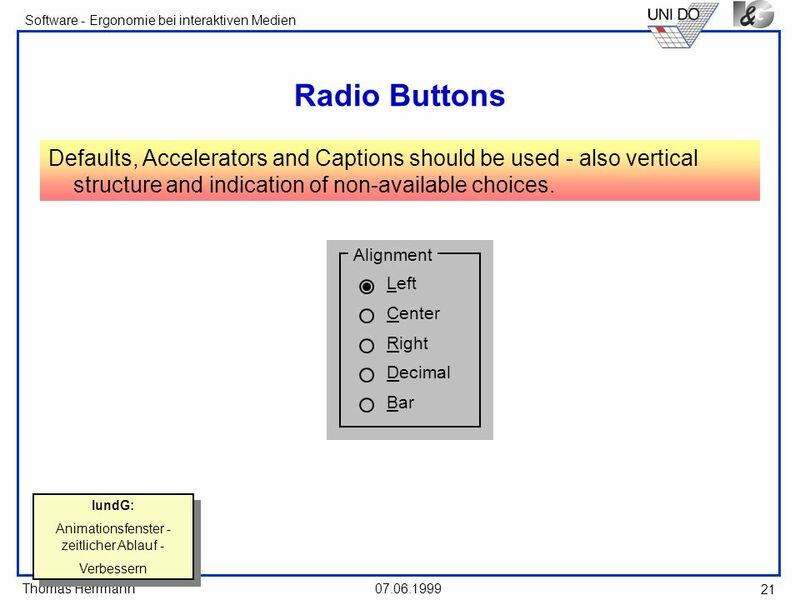 Radio Buttons Menus (Drop-down list boxes) Entry One entry area Four entry areas. How often is an item entered or selected? How often is an item changed? 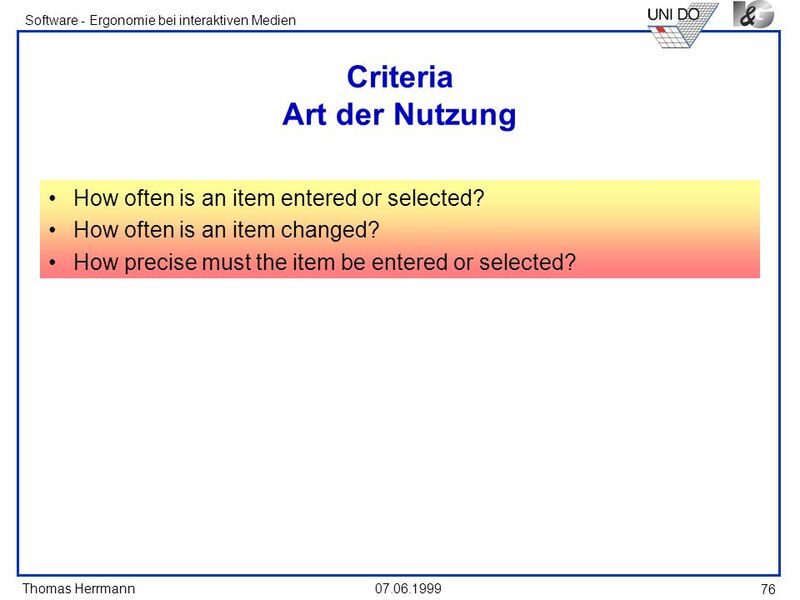 How precise must the item be entered or selected? How much training in control operation will be provided? How meaningful or known is the property or data for the user? How rememberable or learnable is the property or data for the user? How frequently used will the system be? Is the user an experienced typist? Permit text entry if any of the following questions can be answered YES: Is the data unlimited in size and scope? Is the data familiar? 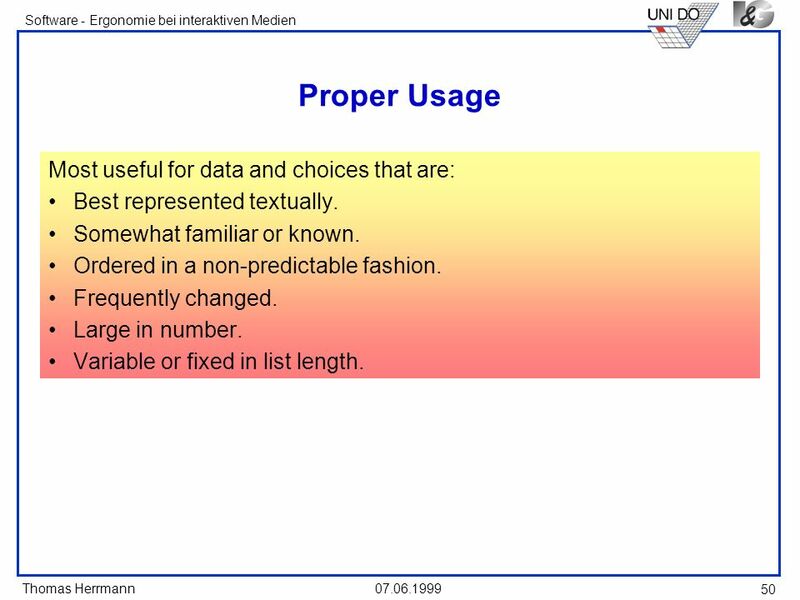 Is the data not conducive to typing errors? Will typing be faster than choice selection? Is the user an experienced typist? 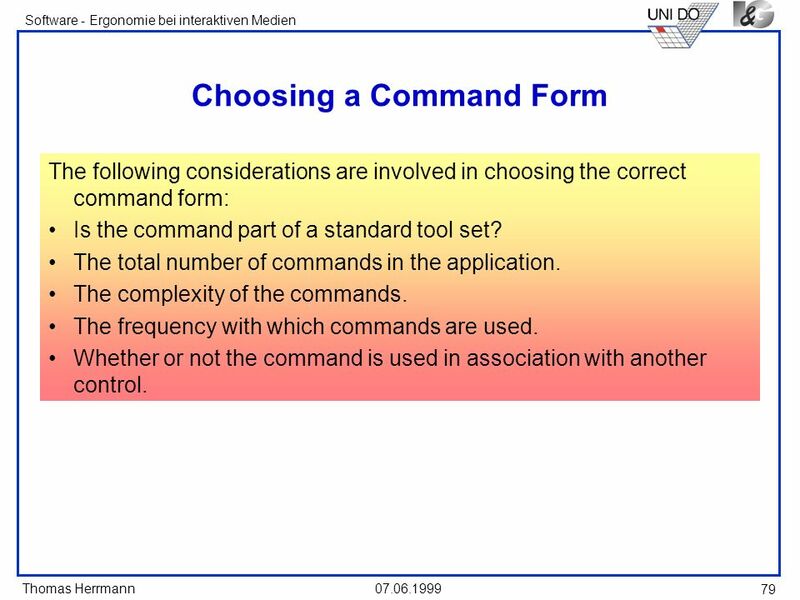 The following considerations are involved in choosing the correct command form: Is the command part of a standard tool set? The total number of commands in the application. The complexity of the commands. The frequency with which commands are used. Whether or not the command is used in association with another control. 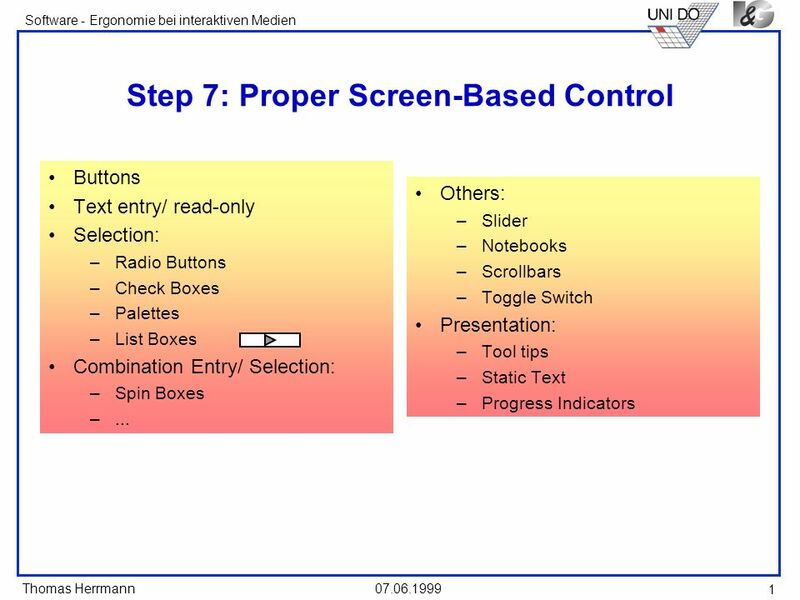 Download ppt "Step 7: Proper Screen-Based Control"
Thomas Herrmann Software - Ergonomie bei interaktiven Medien Arten von Messages System messages Status messages Notification/ Informational. Thomas Herrmann Software - Ergonomie bei interaktiven Medien Create Meaningful Icons. Objectives Build and modify an organization chart. What is a Dialog box? A Dialog box is a window or “form” that contains other child windows or “controls” that have a specific appearances and pre-defined. CREATING A MULTIPLE PAGE REPORT Presented by: Dr. Ennis-Cole. 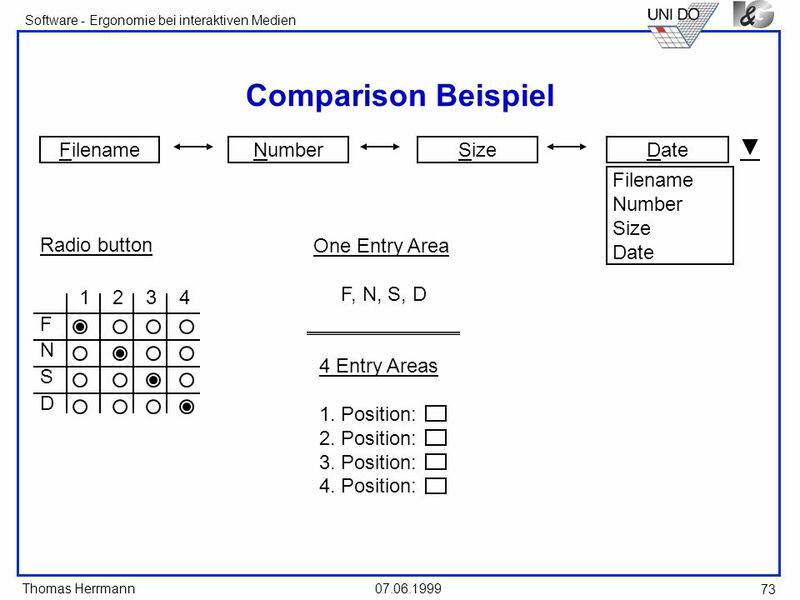 Module Word 2007 Basics Learning Outcomes Learn basic Word 2007 commands. Create, save, and print documents. Apply text, paragraph, and page formats. Review. Microsoft Word A full-featured word processing program for Windows and the Macintosh from Microsoft, which is included in the Microsoft Office suite. What.  2006 Pearson Education, Inc. All rights reserved Introduction to the Visual C# 2005 Express Edition IDE. Interaction Styles Interface Widgets. What are Interaction Styles?  A Collection of interface objects and associated techniques from which an interaction. 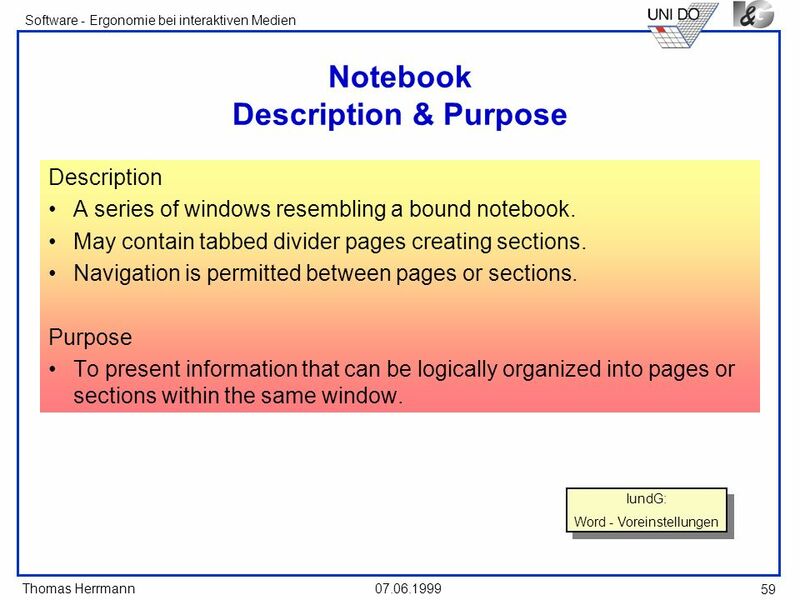 Chapter 4: Working with Windows Types of Windows –Program Windows –Message Boxes –Dialog Boxes Elements of a Window –Window Panes –Scroll Bars –Menus –Tool. Copyright 1999 all rights reserved Screen-Based Controls n Primarily ready-made objects –Standard look and feel across applications –Available in APIs. Thomas Herrmann Software - Ergonomie bei interaktiven Medien 07.06.1999 1 Arten von Messages System messages Status messages Notification/ Informational.